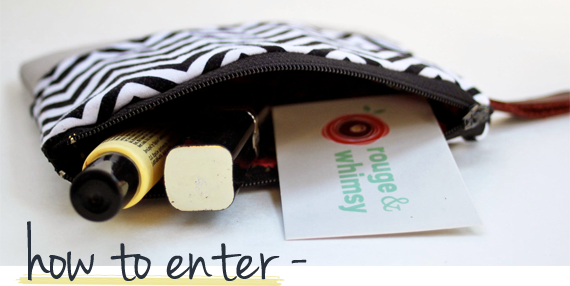 Bubby and Bean ::: Living Creatively: GIVEAWAY // Win A $50 Shop Credit from Rouge + Whimsy! 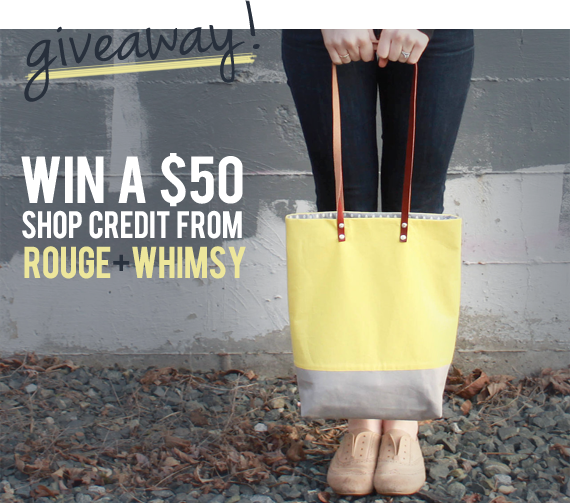 GIVEAWAY // Win A $50 Shop Credit from Rouge + Whimsy! I'm starting to think that June might just be the month of really awesome giveaways around here! Today I'm excited to be teaming up with June's featured sponsor - the wonderful Erika of Rouge + Whimsy - to offer you guys the chance to win a $50 credit to spend in her accessory shop! I absolutely adore the fabrics (black and white chevron and stripes alongside bold solids, yes please) and colorblock techniques she uses for her handmade clutches, purses and totes. There are so many gorgeous bags in her collection, and now one of you is going to get to go shopping and pick out your very own (or two!). To enter, just visit the Rouge + Whimsy Shop and leave a comment below telling me which item is your favorite. That's it! This giveaway is open through July 6th. The winner's name will be randomly chosen and announced shortly after. Thank you again to Erika for giving Bubby and Bean's readers the chance to win a shopping spree at Rouge + Whimsy! UPDATE: This giveaway is now closed. Please check back soon to see if you won! I'm in loooooove with her yellow color block tote bag purse. It's the perfect color combo! I follow you via bloglovin and love your posts, thanks for the opportunity for a Cool giveaway. I love the colourblock hobo purse! I like the color block tote! follow on twitter. Beautiful profile background on there too! I liked R+W on FB! The orange and magenta tote is my fave! I love the wristlet clutch in black and white chevron with blue bottom by rouge and whimsy! I've been lusting after her chevron wristlet clutches for quite some time! I follow Rouge & Whimsy with Bloglovin! I love the colors yellows and gray together. I'd love to buy that colorblock tote. My fave is the wristlet clutch in black and white chevron with blue bottom. I follow Rouge and Whimsy's blog too ! I love the color block purse crossbody hobo bag in mint and green. Ooh those chevron wristlets are cute! What a cute shop! Hard to pick a favorite, but I'd pick the wristlet clutch in black and white with green. I LIKE Rouge + Whimsey on Facebook. I Follow Rouge + Whimsey on Twitter. I follow the Rouge + Whimsey blog via Google Friends Connect. Thanks! I really like the color block tote bag! I love the color block cross body purse in orange and pink! I love the coral & grey tote! Following Rogue + Whimsy on Twitter! Liked Rogue + Whimsy on Facebook! Following the Rogue + Whimsy blog via bloglovin! I'm a follower!! What a great giveaway! I really, really want a chevron clutch! So cute! follow her blog via HelloCotton! Love the orange and magenta pink color block tote bag! I'm in love with the colorblock crossbody bag in yellow and grey. so buttery and lovely! I liked Rouge & whimsy on facebook! aaaand I'm following the blog :) <3 those bags! I love the stripe purse crossbody bag with green and leather straps by rouge and whimsy!! I like Rouge + Whimsy on Facebook - Cindy A.
I'm loving the black and white wristlet clutch with the green bottom! Following the Rouge + Whimsy Blog with GFC as Francesca. Oooh, I love any of those butter yellow & grey bags. loving the wristlet clutch with the black & white chevron and gray trim. Well basically I like everything in the entire shop but if I had to choose one item it'd be the chevron wristlet clutch with the blue bottom piece. i love both of the black and white chevron wristlists. I like the wristlet clutch in black and white strip with green bottom. I adore the wristlet clutch in black and white chevron with gray bottom! I like Rouge & Whimsy on facebook. My favorite is the tote bag purse in coral and gray color block with leather straps. LOVE the colorblock hobo purse. I tweeted about this great giveaway! Love the coral colorblocked tote! I also like Rogue & Whimsy on Facebook! And I follow the Rogue & Whimsy blog! I like Rouge and Whimsy on fb! The color block purse tote bag in orange and magenta pink with leather straps by rouge & whimsy is my favorite! I like the color block purse tote bag in orange and magenta pink with leather straps :D so cute! Love the yellow and grey color block tote bag purse! I love the color block tote bag purse in yellow and gray with leather straps by rouge & whimsy. Thanks for this great giveaway and have a blessed 4th of July.